When a Car Dealer “Rips You Off” Who Should Be Held Responsible? (1) The elderly, often widows. (2) The very young, usually buying their first car. (3) Those who don’t speak or understand English well, not born in this country. (5) People with bad credit. (1) The elderly, especially widows, are the most victimized. The reasons for this are that Florida, especially South Florida, is a “retirement” state. Baby boomers and pre-baby boomers make up a disproportionately large percentage of Florida’s population. Not only that, but life expectancies have soared in recent years…81 for a woman and 76 for a man. Men usually predecease their wives. Women’s role in the American culture is a great deal different than in the 1930’s and 1940’s. More often than not, the husband was not only the breadwinner, but the decision maker in the household. Widows of that era are often buying their first car today. Men and women in their seventies, eighties, and nineties (Yes, I have a lot of customers in their nineties) aren’t as sharp as they once were. I’m 73 and I’ll be the first to admit this. In my opinion, men and women of my age, and older, are more trusting. We can’t forget the terrible disease, Alzheimer’s. Unless a court declares a person incompetent, a person with Alzheimer’s can legally buy a car in Florida and it happens all too often. This is one of the most despicable acts that some car dealers commit. (3) South Florida is not only a retirement area, but it’s a haven for immigrants from Cuba, Haiti, and South and Central America. Many of these are first generation Americans who have a difficult time with English or can’t speak, read, or write English at all. These people are easy prey for unscrupulous car dealers. Can you imagine how difficult it would be for you to get a fair price on a car you were buying in a foreign country where you were did not speak or understand the language? (4) Let’s face it; there are too many Americans who never had the benefit of a proper education. We have too many high school dropouts and too many high school graduates who still can’t read or write as well as they must to function in our society. Lack of a good education is one of America’s most serious problems and we’re seeing other countries like China, Japan, Germany and India pass us by in educating their children. It’s almost criminal how the educated are exploited by car dealers’ advertising and sales tactics. How many car dealers’ TV advertisements have you seen that you laugh at, knowing that they are totally untrue, “bait and switch” to lure you into the dealership. You wonder who would believe that kind of nonsense. The reason that car dealers keep running those ads is because they work. (5) There are always people with bad credit who have to buy a car, especially in today’s economy. In Florida, without an effective mass transit system, a car is virtually a necessity to get to your job or find a job, not to mention the doctor, school, or the pharmacy. People with bad credit are at the mercy of the car dealer. The main thing on these peoples’ minds is not how good a price or a car can I buy or how low an interest rate, but can they be financed? Knowing this, car dealers will charge whatever price and interest rate the lender will let them get away with. People with bad credit almost always pay dealers a higher profit than those with good credit. (6) The title to this article asks the question, “Who should be held responsible for car dealers ripping off customers?” For categories (1) through (5), the answer is our regulators and our lawmakers. But for the last category, “Everybody else”, it’s themselves. Of course, it goes without saying that the car dealers who do this are responsible too. But who doesn’t know that most car dealers do business this way? Who doesn’t know that car dealers perennially rank last on the annual Gallup “Honesty and Ethics in Professions” poll? I recently received an email from a woman who fell in none of the first 5 categories above. She was terribly victimized by a very unethical car dealer from whom she bought two used cars on the same night. Her email asked me for advice on what she should do. Of course the “horse was out of the barn” and this makes things more difficult. This woman did not ask for or receive a CarFax report on either used car. Nor did she take either car to her mechanic for approval. She clearly didn’t investigate the dealer for reputation. She didn’t check any sources like Consumer Reports for recommended used cars. She did not shop and compare prices for similar cars and the list of “did not’s” goes on. If you don’t do your due diligence when you buy a car you are equally culpable with the car dealer who took advantage of you. 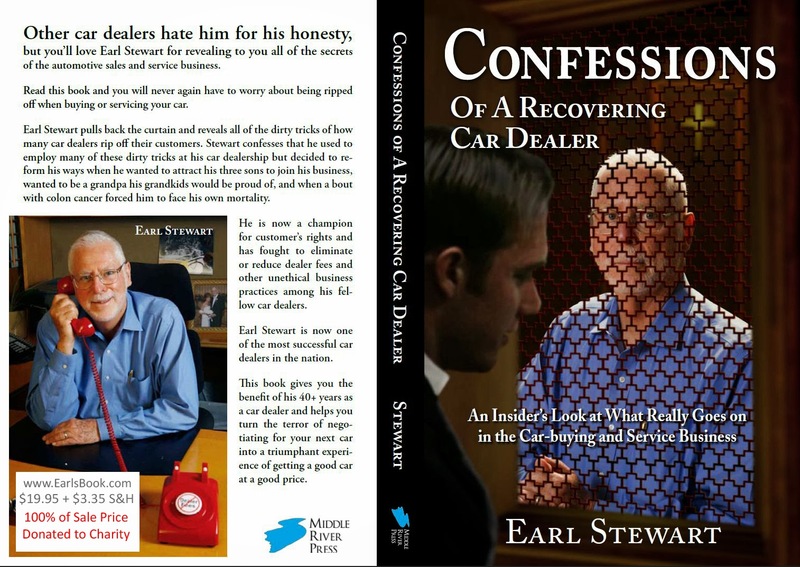 At this point, I will shamelessly plug my book, Confessions of a Recovering Car Dealer. I say “shamelessly” because 100% of the proceeds from my book go to charity. You can buy this book at www.Amazon.com. It will tell you everything you need to know about how not to be ripped off by a car dealer. Or, you can read my blog articles on this at www.EarlOnCars.com. 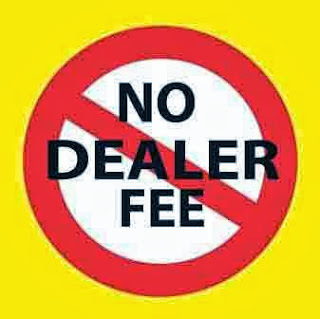 (2) The dealer will often tell you that all car dealers charge Dealer Fees and that they are required by law to add the dealer fee on every car they sell. Simply tell them that you know this is not true and you can cite me and other car dealers like CarMax who do not charge a dealer fee. Print out a copy of this article, show it to them, and tell them that you know that there is no law that says he must charge you a dealer fee. Florida Sen. Joe Negron is leading an effort to roll back about $12 of the cost of registering a car in Florida. He says this will save Floridians about $230 million a year. This is to bring back the tag registration cost back to where it was about 4 years ago, when the legislature raised it because of the bad economy. 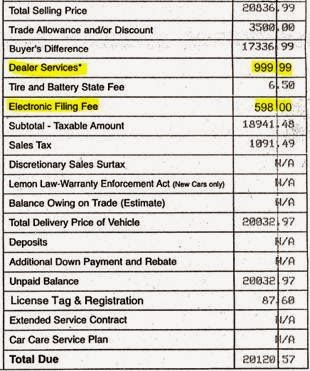 What Sen. Joe Negron and, apparently, the rest of the Florida legislature either doesn’t know (or care) about is that, at about the same time, car dealers began passing along and marking up an expense to car buyers. This is increasing their profits far more than the $230 million a year that reducing tag registration fees will save. This increased profit to car dealers is generally called the “Electronic Filing Fee or E-Filing Fee”, but there are other names that dealers use, just as they do for the infamous “dealer fee” like “dealer services”. Car dealers used to process the tag and registration required on new and used cars themselves. About 4 years ago they began outsourcing this to companies that can do this work cheaper than they can themselves. The typical cost of this outside service is only $10 or $12. So, not only did the car dealers reduce their expense, they passed along the reduced expense to you, the car buyer! But wait, there’s more! Car dealers are also markinging up this reduced expense up and passing this along to you too! I’ve seen Electronic Filing Fees marked up to $598…that’s a 5,980% markup! At my dealership I began using a registration service company named Title Tech in 2009 and they charge me $10 to prepare the tag, registration, and title work for each new customer. This saves me considerable time and money from doing it myself. In the past always absorbed the higher expense and I don’t pass along the reduced cost to my customers either. It’s adding “insult to injury” to mark up this cost and pass it along to you. The word “fee” is almost always used by dealers when they are trying to disguise additional profit or to pass along an expense to you (which is the same thing as additional profit). When car buyers are lucky enough to even notice the Electronic Filing Fee, they usually assume it’s a tax or fee charged by the state, federal, or local governments. They do the same thing with the dealer fee under its various other names like documentary fee. Florida law considers the Electronic Filing Fee to be the same thing as a Dealer Fee and requires that it be disclosed and used by car dealers as such. The language Florida requires for disclosure is “This charge represents costs and profit to the dealer for items such as inspecting, cleaning, and adjusting vehicles and preparing documents related to the sale”. The law also requires that the Electronic Filing Fee be included in all advertised prices. Unfortunately most dealers are ignoring this law just as they do with the additional profit they make with the Dealer Fee. Dealers almost never include their Dealer Fees or Electronic Filing Fees in their advertised price which is a flagrant violation of Florida law. If they even mention that they have a dealer fee, they will say in the fine print something like “prices plus tax, tag, and fees”. A few dealers will disclose in the fine print, “plus tax, tag, and $999.95 dealer fee”. The Florida Senate says “The law requires that the fee be included rather than “specifically delineated” in the advertised price.” Most car dealers’ advertising is done on TV and the fine print disclosure is literally unreadable. The other loophole permitted by Florida law is to allow the dealers to offer only one car with the dealer fee included in the price. That would not be so bad if the dealer clearly communicated this to the buyer. But dealers use something I call “the old stock number trick”. Every car in a dealer’s inventory is assigned a stock number for accounting purposes. A typical stock number is something like “A25771”. Dealers will put their stock number for that particular advertised car in the fine print at the bottom of the ad or elsewhere. Even if a customer sees the stock number, they have no way of knowing what it means. When the prospective buyer responds to the advertisement, the salesman tells him that the advertised car was sold but, “not to worry”, he has several more “just like it”. Yes, he does have several more identical cars in terms of model, accessories, and MSRP. But, because they have different stock numbers, the law now permits him to add his extra profit to the advertised prices disguised as Dealer Fee and Electronic Filing Fee. It’s an affront to the car buyers of Florida that their Attorney General and their legislature allow this to continue. Car dealers have powerful lobbying groups and they clearly communicate to Pam Bondi, the AG, and the legislature that they better not mess with their Dealer Fees and Electronic Filing Fees. Another reason you don’t hear much about this atrocity on consumers is that the media has assumed their “Hear no evil, see no evil, speak no evil” stance. The TV, newspapers, and radio are deathly afraid of losing car dealers’ advertising. Car dealers are the largest local advertisers. Some of you may know that my wife, Nancy, and I were recently fired from our weekly consumer advice radio show on Seaview radio which we had done for almost 7 years. This was because of dealer threats to cancel their advertising. When I reported this attack on free speech to the Palm Beach Post, they refused to run the story or even allow me to purchase an advertisement that states the truth. 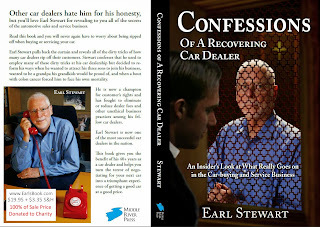 As you know, on October 22, Chet Tart, General Manager of WSVU (SeaView) radio in North Palm Beach/Palm Beach Gardens visited me in my office and told me that you had ordered him to cancel “Earl Stewart on Cars” which had been airing on SeaView Radio for about seven years. Every Saturday morning Nancy and I gave advice to huge number the car owners of South Florida who called our show for advice. Nancy focused on giving advice to women who have become a powerful economic force in car buying, leasing and servicing but who are treated by car dealers with less respect than men. We were unique in that we “told it like it is”, naming car dealers who wronged car buyers. Our show, Earl Stewart on Cars, provided a community service to the south Florida area and was, in many people’s opinion, the most important show on SeaView. As you know, in all the years that we were on the air, neither SeaView nor Nancy and I were sued by any car dealer for what we said to our audience. This indisputable fact speaks volumes. Any lawyer will tell you that the truth is the perfect defense against libel and slander. 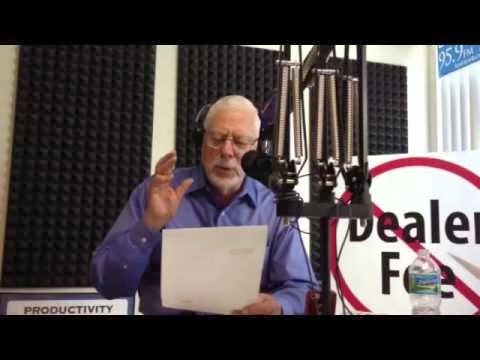 Every week, we implored car dealers and employees of car dealerships to call into our show and have their fair say. I promised to allow them to speak as long as they wished and encouraged then to tell me if I said anything that was untrue. Only a very few dared call to criticize us but a few car dealers did call to compliment us. I always said that there are honest, ethical car dealers, albeit too few. I kept a list of recommended car dealers and a list of those I don’t recommend. I used the information from my weekly shopping report to decide. Through Chet Tart and your advertising salesmen, you have been threatened often over the years by car dealers. They called Chet Tart and they told your advertising salesmen that they would either cancel their advertising unless you got rid of Earl Stewart on Cars, or that they would never advertise unless you did so. Chet would tell Nancy and me about these threats, but he also always told us that he supported and defended us and that he thought that our show was an asset to SeaView and to our community. He bragged about our very strong ratings; sometimes we were actually the #1 radio show in the South Florida market for our time slot and demographic. We were almost always in the Top Ten. Advertisers clamored to be on our show because of its strong ratings. Although we paid for separate advertisements on SeaView, we never paid for our show, “Earl Stewart on Cars”. I told Chet, that we did not want our show to have the stigma of an infomercial. All of the other talk shows on SeaView either pay for their air time or are responsible for bringing in advertisers. We did neither. Chet even agreed to pay us a token amount for the show, even if it was only $1. Jim, you’ve been in the broadcasting business a long time, just like I’ve been in the car business a very long time. We’re about the same age. I’m not saying that older business owners are always smarter than the younger ones, but I honestly believe that oftentimes we are wiser. Wisdom comes with experience and we’ve both had a lot of that. One thing that experience has taught me is that when I make a mistake, I shouldn’t be afraid to admit it. I found that is not only better for my business but better for my brand image because it earns the respect of my employees and my customers. I sincerely and respectfully believe that you made a mistake in canceling our show. I’m basing my opinion, not on the fact that I believe it was ethically wrong although I do, but because it is economically wrong. It would be easy for me to say that you should reinstate our show because our show was a strong benefit to the community and you should not cave in to threats by car dealers who are a problem for the community. But, I’ve owned and operated businesses for 46 years and there are times when you have to put survival first and principle second. This is probably one of those times for SeaView. I’m well aware that SeaView is struggling financially and you owe its survival, not just to yourself but the other stockholders and SeaView’s employees and their families. I’ve experienced similar situations with companies I’ve owned and operated. Survival trumps principle. This is why I’m asking you to consider that cancelling our show is a bad economic decision for SeaView for the following reasons: (1) Earl Stewart on Cars had a lot of listeners and our audience was growing regularly. Chet, Nancy and I discussed syndication of the show on several occasions and most recently we discussed expanding the show to two hours from one. (2) The public and especially our listeners don’t like what you did to Nancy and me. Since I’ve gone public with our being “fired”, the response has been huge and totally in our support. They don’t understand that you feel you had to do this and, let’s face it, some in your organization don’t understand it either (although they are afraid to say so). This negative PR is very bad for business. (3) Most South Florida Car dealers don’t like me. It’s a distinct possibility that most of them who told Chet Tart or your salesmen “Fire Earl Stewart and I’ll advertise on your station” were lying to you. They may have been telling you this just to get back at me. It will be interesting to see how many car dealers Chet and your sales force are able sign up now that I’m gone. Wouldn’t it be tragic if you lost your best talk show and didn’t get any advertising from those dealers who told you they would come back! Clearly, the best management decision for SeaView in the long run, is to reinstate “Earl Stewart on Cars”. You’ve already received a letter from my attorneys telling you that if you don’t bring back my show, I “will be left with no choice but to pursue whatever legal remedies are available to me.” Believe me, Jim, when I tell you that nobody hates litigation and lawyers more than Nancy and me. Litigation is always a last resort with me. If this was just about SeaView and Earl and Nancy, we would have just shaken off the hurt and surprise and walked away. But it’s about tens of thousands of loyal “Earl Stewart on Cars” listeners who rely on our show every week for advice on “how not to get ripped off by unethical and dishonest car dealers”. We can’t let them down and we won’t. Please call me so that we can meet personally and privately to resolve this…just you, Tricia, Nancy and me. My office number is 561 844-3461 and my cell phone number is 561 358-1474. We’ll all apologize to each other and work together to make SeaView Radio one of the leading radio stations in the market.